One very big mistake most people make while choosing a longboard is that they will buy without considering the best longboard size to get. People have this misconception that any size board will do for them, and consequently often end up buying them based on appearance and looks. As a result, you compromise on the proper user experience. With the wrong size, you trip, stumble over, fail to maintain balance and stability, and the list of errors goes on and on and on and failing to choose a right size of longboard may occur a fatal accident for you. In this regard, we have a fantastic informative article about how to prevent longboard accidents. We are therefore on a mission today to educate you on How to choose the best longboard size for yourself! Before we even begin to guide you to pick the best longboard size, we think it is very important that you know why picking the right size is important in the very first place. First of all, it is really just common sense. It isn’t your “one size fits all kind of thing”. Like it is with clothes, shoes, bags, etc, the board size will vary person to person. And there are many factors which will manipulate the size you should get. We will get to that later, but for now, let’s understand the hazards of getting the wrong size! If you get a board that too small, it won’t be able to take on your weight and it may eventually break or even snap in half! If it is too small, you won’t get enough leg space. On the other hand, getting a longboard that’s too large for your means you will need more strength to push it forward. It will wear on our and you will not be able to make proper turns and curves. Well, where do we even start with this? You will regret not checking the best longboard size from the very moment to step on to the board to the moment to throw it out your window. One of the most prominent reasons behind this is that you won’t be able to push the board too far due to its odd size. You will fidget, stand in awkward positions, try various speeds, and then, you will give in to the frustration of all your failed attempts. Apart from these, getting the wrong size also means more than usual frequency of falls, stumbles, and injuries due to misbalance and instability. The best longboard size ensures fewer injuries and discomfort. So, yes. Don’t just walk into the buying the flashiest longboard without even judging its compatibility with you. Be a good noodle and follow some very basic yet significant steps to choosing the perfect size of longboard for yourself. Above all, to protect yourself from longboard accident injuries, one need to know, especially the novices one, how to ride or ollie on a long board. 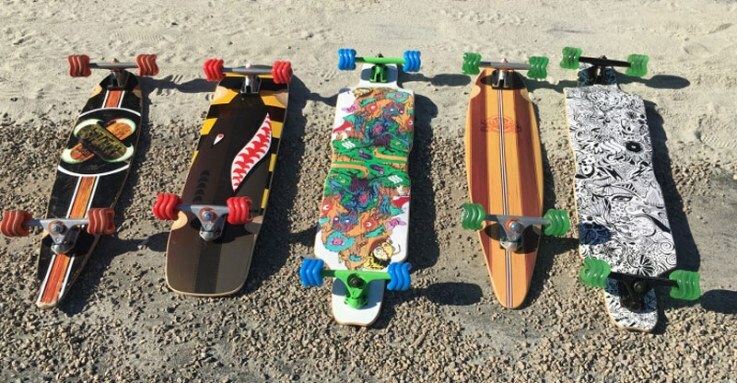 One of the nicest things about longboards is that it can be enjoyed by almost all age groups. Toddlers as young as 6 to 8 can use them, and adults as old as their legs can bear! However, what you have to make sure is that you get a size that complements your age and growth. Fortunately, to make things easier for us, longboard manufactures and designers produce them in various sizes and scales. You have sizes from Junior, Youth, and Adult. However, you can also choose from XLs, XXL, Small, Large, etc. Now keep in mind that, despite the concept of universal sizing, sizes will still vary from one company to the next. So we always advise checking with the brand beforehand. Do not assume what work for an adult should also work for a teen. Now, what exactly decides the candidate of each of the classifications? Shoe size, of course! Your feet are going to be running the longboard, and so needless to say, the size of the board should more or less vary with the size of your feet. But relying on just shoe size isn’t enough to make a good “guess”. If there is any factor you want to correlate with shoe size, it is the width of the deck on your longboard. The bigger the foot, the wider the deck, and vice versa. Check out the formula below for a quick idea! For absolute tots, say kids under 5 or 6, and with a shoe size of about 3, we recommend getting a micro deck board which should offer a deck width of at least 6.5 to 6.7 inches. For toddlers who fall within the age group of 6 to 8, and have a shoe size from 4 to 6, we recommend getting a mini deck which offers a width of at least 7 inches. For preteens who fall within the age group of 9 to 12, and have a shoe size of 7 from 8, we recommend them getting the deck with a width of 7.3 to 7.5 inches. For kids over the age of 13 and over, with a shoe size of 9 and above, we recommend getting a deck with a width starting from 7.5 inches wide. And of course from here on, as you age and your shoe size changes, so should the width of the deck of your longboard. But, now that the width is covered, how do we know which length to get? When you think about the size of your longboards, ask yourself, “What am I buying it for?” This question in itself is the answer to half of our issue today. The type of activity you use your longboard for will massively affect its shape and size. Are you a college student looking for a cheaper commute? Is the longboard for some leisure fun at the skate park? Do you need it for a child? Well, here are some things you need to note down. If you are looking for a longboard for daily commute from point A to point B, then we recommend getting a cruiser. They may offer less speed and thrill factor, but they are perfect for some heavy duty traveling to and from. Cruisers are far more stable and make smoother turn and curves. They are therefore ideal for kids and people who are just starting out. The ideal size for a cruising longboard is from 28 inches to 46 inches in length. If you are someone who lives in a hilly area with lots of slopes, then go for a downhill longboard. This type of boards have decks that are specially made to cruise through angular, elevated and downwards roads. Downhill longboards can reach high speeds but are the tad unresponsive in terms of balance and stability. Not recommended for kids, for alright for teens and adults. The ideal size of a downhill longboards above 36 inches in length. Freestyle longboards are the ones that you would use for tricks and funs. It is usually the most lightweight one since there is usually a lot of maneuverability going on with them. The best part about freestyle longboards is that they can be used both for leisure and more commuting. And therefore, these types of boards do not come with any specific recommendation for size. You can pick whatever you feel and works best for you. However, just in case you get confused, we recommend getting something that is somewhere along the lines of 38 inches or above in length. And then comes one of the most common and known factors of choosing the best longboard size: the user’s height and weight. The height of the user is playing a very prominent role in deciding the size, and more importantly, the length of the deck of your board. Similarly, you weight also plays a very significant role here. The taller you are, the more stability you need. On the other hand, the heavier you are, the wider the deck should be. Getting the right size of longboard according to your height and weight will means a more balanced center of gravity and even weight distribution. For people under 3 ft and 5 inches, this basically falls under the category of juniors or toddlers; we recommend getting a longboard that is 5 to 6.75 inches in width and 27.2 to 27.6 inches height. For people who are from 3 ft 5 inches to 5 ft 4 inches tall, we recommend getting a longboard that measures at least 7 inches in width and 28 inches in length. For people who measure from 4 ft 5 inches to 5 ft 3 inches, we recommend for them a longboard that is along the lines of 7.3 inches in width and 29 inches in length. For people who see the weather up there differently, and measure well above 5 ft 3 inches, we recommend longboards that measure above 7.3 in width and 30 inches in length. The thing about weight is that it never truly directly affects the size of a longboard. However, it does affect the thickness of the deck. The heavier you are, the thicker the deck should be. This is, of course, to make sure that the deck does not snap in half. On the other hand, if it is the speed that you are more interested in over stability, then get a board with trucks that are substantially smaller than its deck. This type of longboard is the most ideal for smoother, more even roads. Always check the wheels and the truck before purchase. These 2 components will, to a great extent, decide the height of the deck from the ground. If you want a longboard that’s taller, then get a drop down truck with wheels of a higher diameter. Similarly, if you want a board that’s closer to the ground, then opt for drop through trick with smaller wheels. You can control and adjust the difference in size of the deck from the ground using risers. There are heaps of risers sold separately so you have multiple sizes to choose from. Check and comb through Amazon for more details on this! If you think you would like to transfer from a smaller board to a larger one, or similarly, from a larger board to a smaller one; you can easily do that without having to change to the entire board! All you have to do it replace the deck by unscrewing the trucks underneath it. Essentially, the only thing changing is the size of the deck. Everything else remains the same. This is an odd one, but one secret tip we always give away to anyone looking to buy a longboard is that you take a few rides on it without your shoes on. Yep. Testing the board without your shoes on gives you an idea on how well the shape and size of your feet balance on the shape and size of the deck. You can, from there on, understand or feel how well the board with would, therefore, complement your feet with cleats, pumps, sneakers, sandals, etc, on them. If the board works well on barefoot, it will work well with almost anything else. Well, other than heels but you know what we are talking about. After making a bad purchase, many people try to change the size of their longboards by changing its shape via some rookie level construction work and power tools. Don’t do that. It does nothing to help, and in fact, makes matters even worse. Once you get the wrong size, unfortunately, there’s no fixing it or going back. Getting the best longboard size next time is the only way to roll unless you have a replacement policy.